I caught bait early this morning then picked my clients up at 6:30 at High Point. We rode for over an hour looking for schools but I never saw what I wanted to fish so I decided to go shallow and put out a whole lot of baits. We started taking hits on ledges but the first 5 or 6 fish were punks. Once we found the part of the ledge the fish were holding on we proceeded to catch keeper after keeper. We would only see a fish or two here and there on the ledge but that was what it took to consistently catch fish. We had to get off the water early because Matt had to go back to Winchester but they had more fish than they could handle. 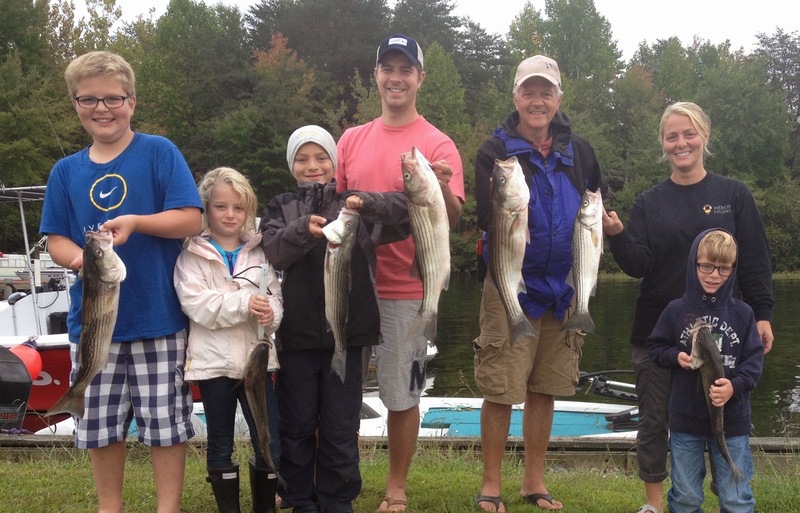 When John booked the trip he said all he wanted was for his son to catch fish, and that is exactly what he did this morning. Here is a great idea for my clients, journal followers and friends. DP Seay, one of my guides, is giving away a full day charter for up to 6 anglers (a $650 value) to be used anytime in 2014 or 2015 to raise money for his daughter's travel softball team. The 12U Thunder Softball Team needs to raise money for the upcoming season and are raffling off a trip with DP to help generate some funds. The price for a raffle ticket is $20 each or 3 tickets for $50 and goes to a good cause. This is an opportunity to take or give a trip to someone who already plans to go out with us in 2015 or to someone who always wanted to for 1/32 of the cost of the trip. Ticket sales end on October 9th, drawing will be held October 12, 2014. Please include your email address on the ticket and DP will notify you once your ticket has been received. Thank you in advance for your support and GOOD LUCK!!! 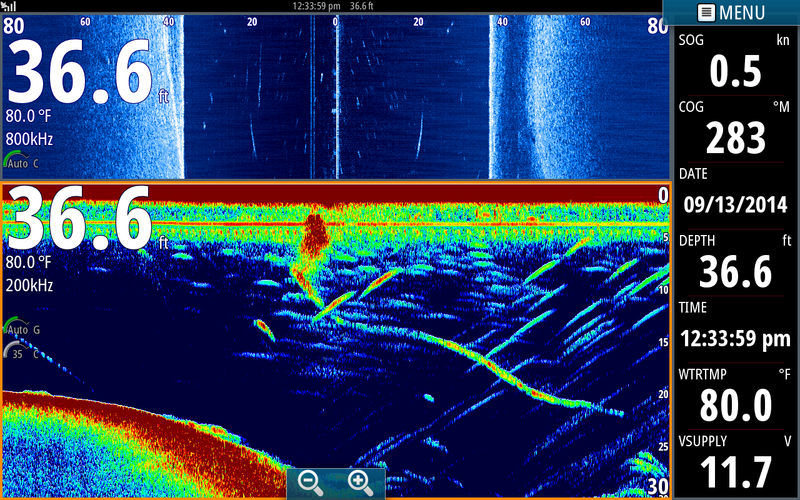 This is a shot I took this morning where I found fish hugging the bottom over 20 feet of water. It was cloudy and rainy and the fish were fairly shallow. We had down lines out at 18 feet and were constantly banging the fish. We had a couple of guys see us catching the fish and come right over thinking they were on them but we never saw them catch anything. Every time we would move they would move right beside us and watch the action. They finally threw their hands up in disgust as we continued to catch Stripers. By the time I popped this picture we had four boats around us trying to keep up with the school. We were still steadily catching Stripers and had been working the same school for over an hour. 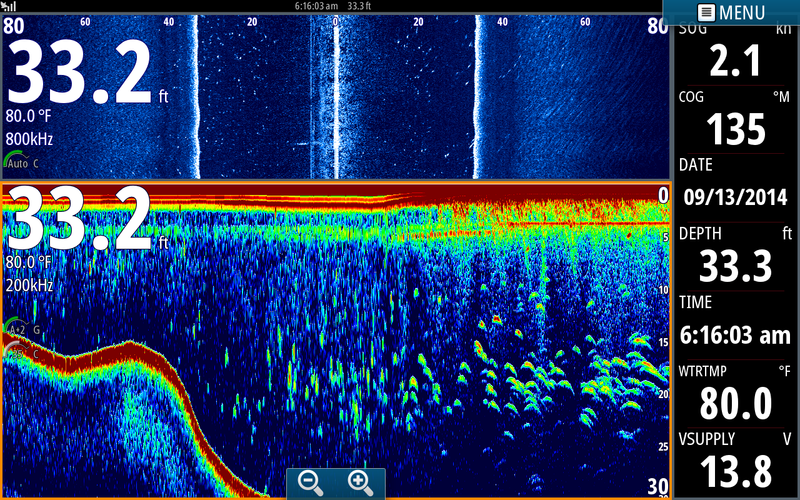 Fish were also breaking on the surface nearby us. My clients were having a ball catching Stripers. In this picture we had just released a nice Striper. 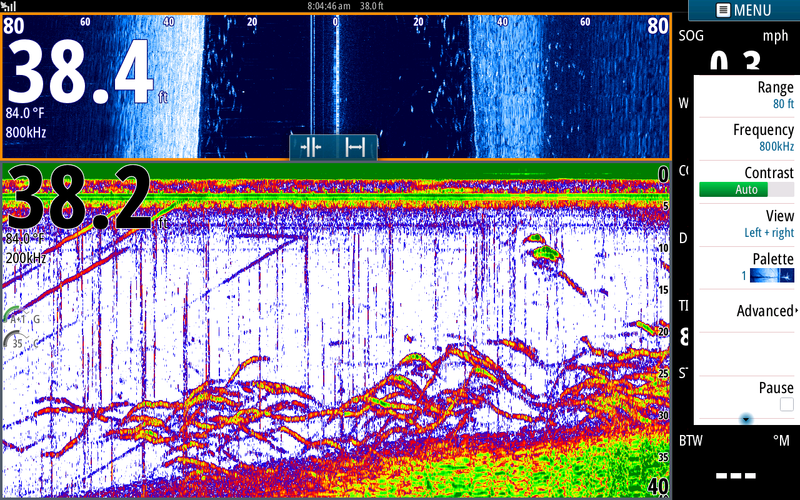 You can see the splash as it hit the water in the center of my sonar screen and you can also see its swimming back down to join the school on the bottom right side of the screen. By the time I popped this picture we had been working the this same school for about an hour and a half. We were getting hungry so I pulled off the school so Kim from Honey Bake Hams in Fredricksburg could make sandwiches and we could take a short break. 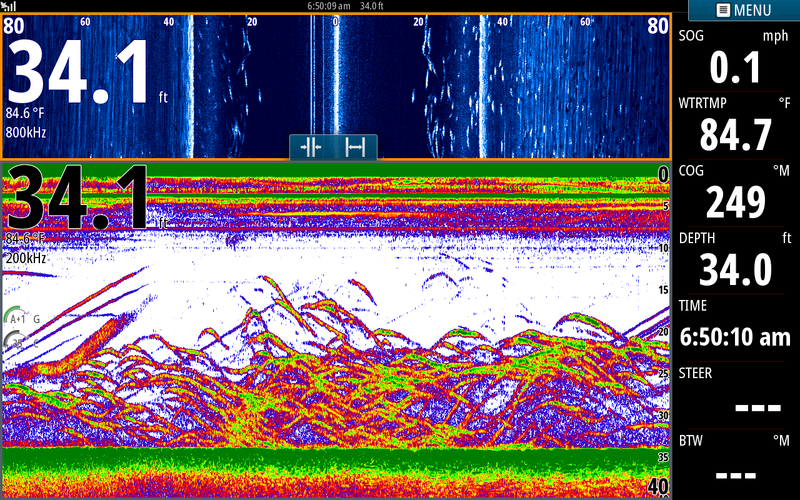 Well the Stripers were not going to let us have any peace, they still hammered us. The rain eventually got uncomfortable later and they decided to call it a day. We had not caught a fish by 9:30 when we went back to the marina to pick up James, a wounded warrior who missed out on the Bass tournament this morning, but once he got in the boat we had almost constant action for 3 hours. James commented "I have Striper thumb, I have to quit handling these fish".......That's a good problem to have. Guess what this is? 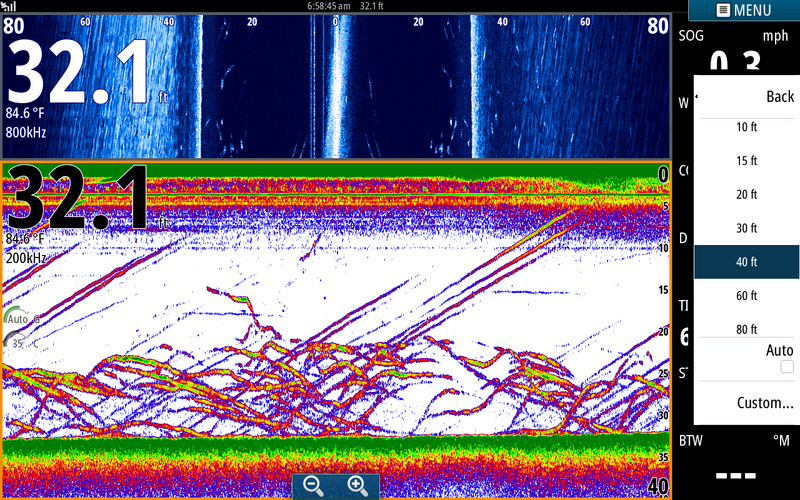 I see a whole lot of disappointed anglers jigging spoons with their eyes fixated on their depth finders wondering why they are not catching any Stripers in the fall. Guess what? You have to be near Stripers to catch them. This pic and the one below are schools of Gizzard Shad. Notice my speed, almost still. My motor is running and I am spooking some of the Gizz directly under the boat which appear to be fish but are in fact Gizz. 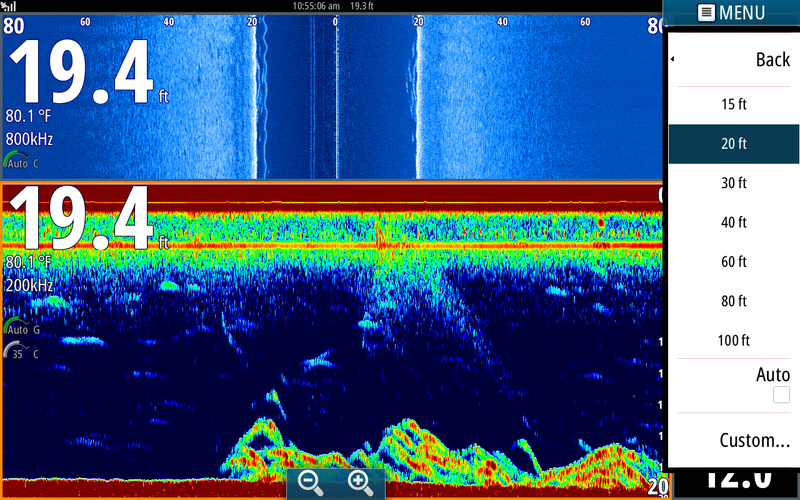 The small vertical lines on my side scan in the darker blue [water] are Gizz swimming getting out of Dodge. Look over to the balance of the school to the right on SS and you can clearly see that they are Gizzards. Again, another school of Gizzards. Jig a toothache spoon on these all day but you will be eating Chicken for dinner. These pics are typical for fall fishing, there could be Stripers nearby but we did not see any yesterday when working these Gizards. 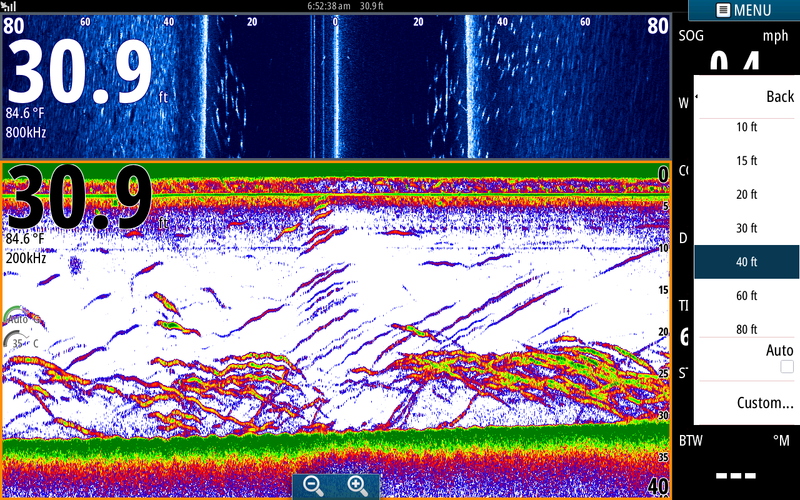 Now, come back through this scenario later and see the bait all broke up and chances are the Stripers broke the school up and are aggressively feeding. This is a screen shot I took going into the back of Contrary creek. I actually was just going into the left arm and in the mouth of Freshwater. 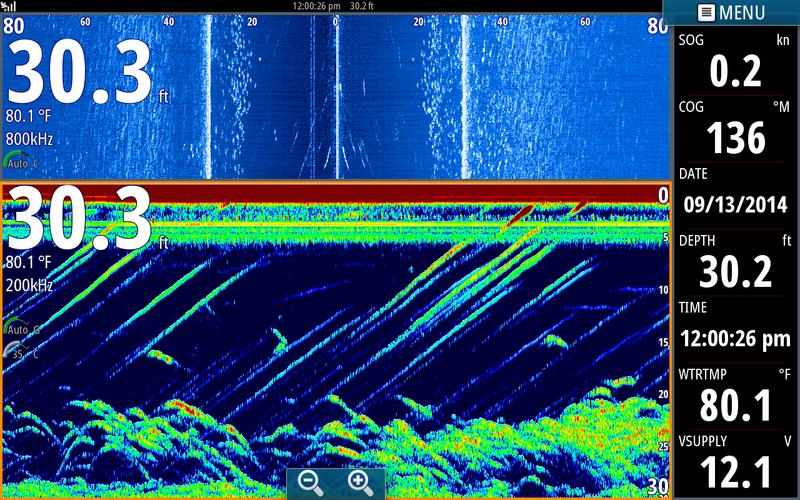 The structure you see on the right side of my sonar screen is Hydrilla. You can also see it on the blue side scan screen. The grass is prolific all the way to the back of the creek. These are screenshots I took yesterday when I had a chance while working the same school of fish. I located the Stripers at 6:35 and we started hooking up. When things slowed a bit I took this shot. This school was huge and occasionally busted on the surface. 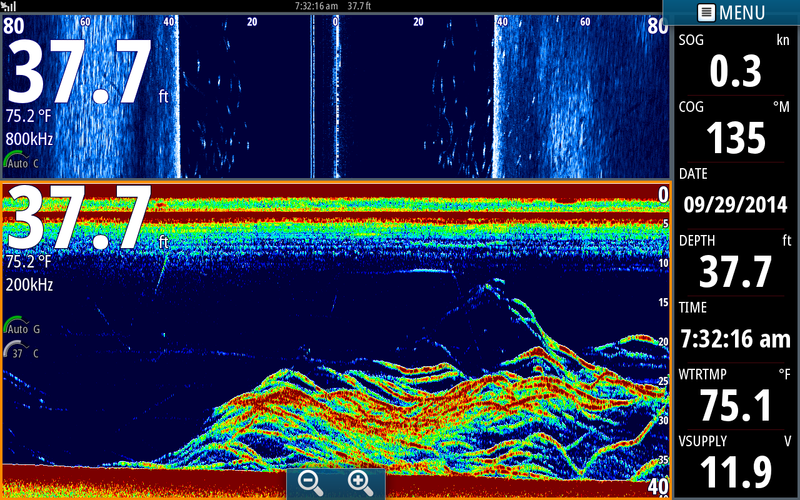 I chased it from the marina all the way to Rose Valley using my Simrad. 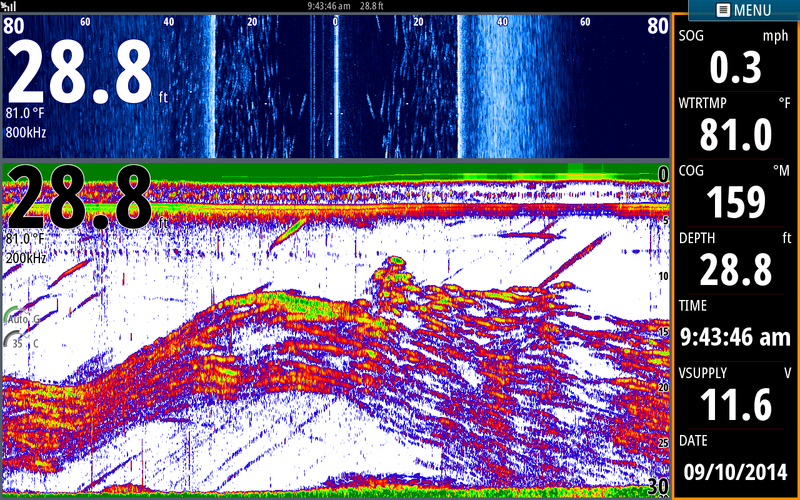 You can see clearly all the fish under the boat on the sonar and fish out to either side of the boat on the side scan. I am still on the school but as you can see in the side scan pic I am beginning to loose them. I turned the boat 90* and located them ahead of us, sped up and got right back in them. We worked them till we used up the 200 baits that I had caught this morning. I left the school and went to catch bait. 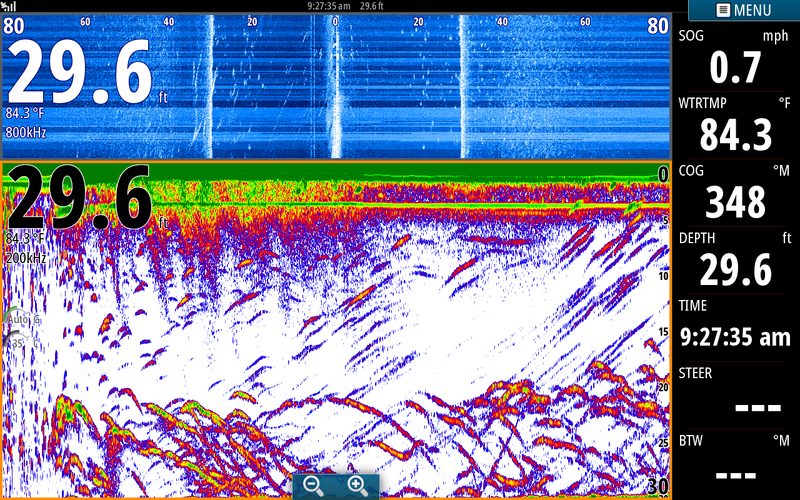 I located a school on my Simrad then stopped the boat, put the trolling motor down and turned on my front Lowrance [Which I have rigged a SS ttransducer on]. I got the net ready, started the big motor up and headed toward where I had seen the school. 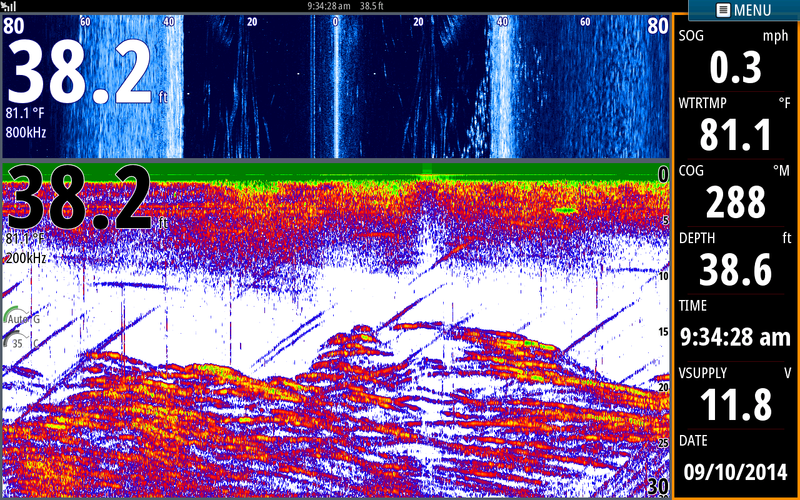 I am now shooting side scan off to the right and left of my boat using my Simrad on the console and looking forward with side scan using my Lowrance on the bow. 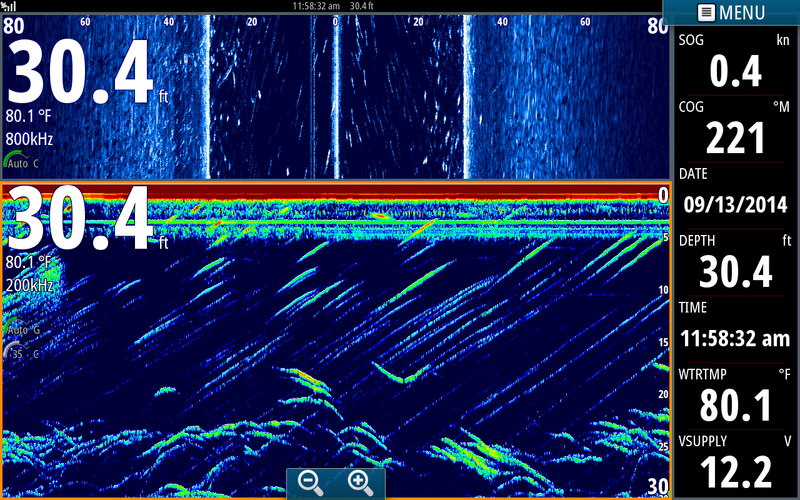 I found the school again with the Lowrance and threw on it catching about 250 Herring in one cast. The pic above is where I relocated the school. 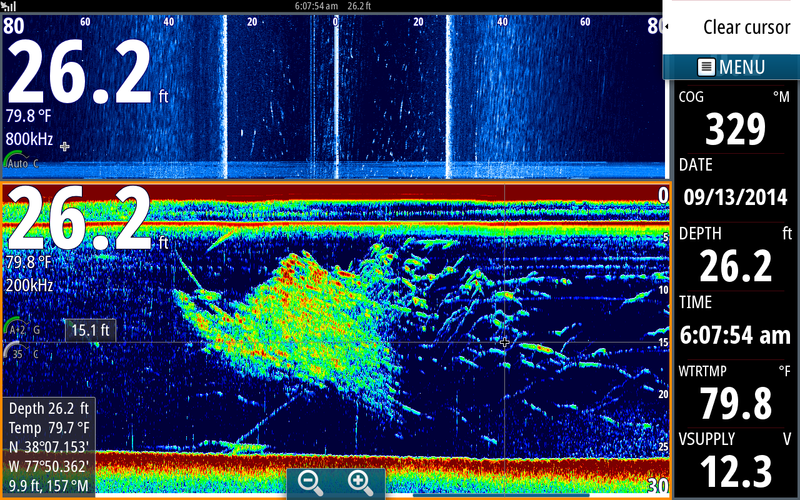 Notice on the left side of the sonar screen I had been running about 20mph to located the fish. Once I found them and slowed down the arches got larger confirming it was the school. We set out baits down to 20 feet and went through another hundred baits in thirty minutes. 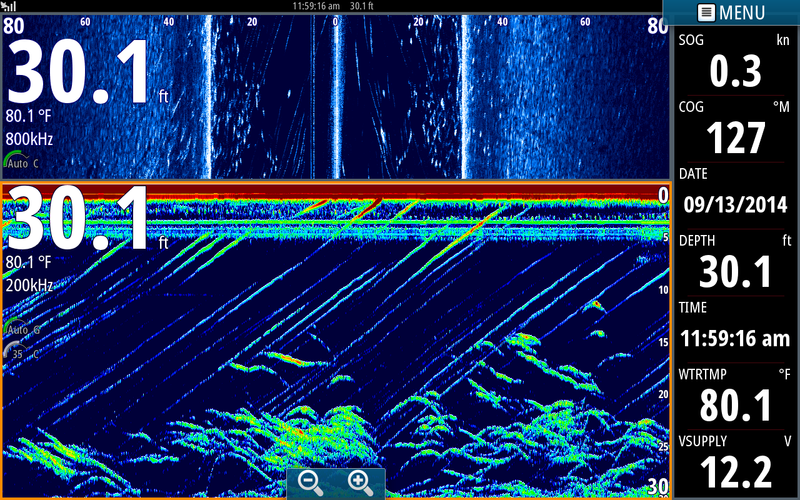 We are still catching the fish here thanks to my Simrad sonar [echo] page and primarily my side scan that allowed me to keep the boat over the middle of the school. 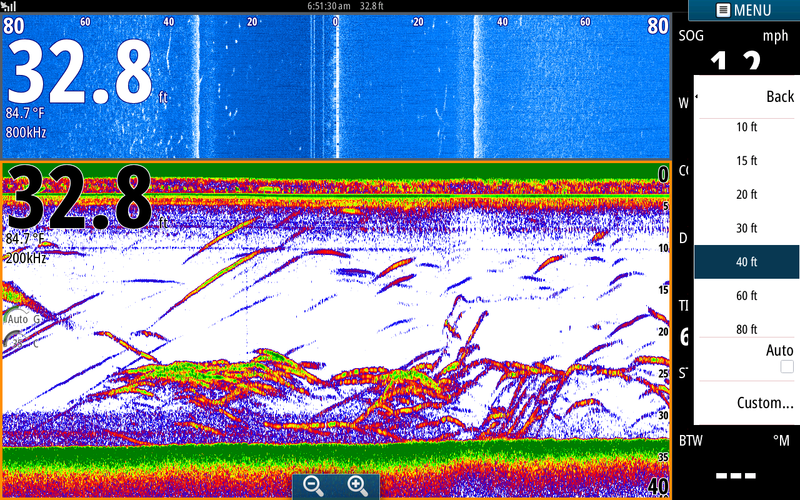 I would simply look at SS and see which side of the boat had the most fish [in this case the right] then steer the boat that direction till all our rods would hook up. If you are ready to get in on some of this action contact me and set up a trip. Better yet if you want to own this type of technology contact Steve Lane at Greentop Sporting goods. Not only do they sell the units but they know more about Navico than anyone I have ever dealt with. Not only will they help you with your purchase, they will show you how to navigate through the different pages and menus, take your unit out of the box when you purchase it, install any software if needed, mate the unit to the transducer you have and set the unit up for the conditions where you fish. If you have issues once it is installed their support is awesome. Don't expect that kind of service buying a unit over the internet or through a big box store. These guys know their electronics. 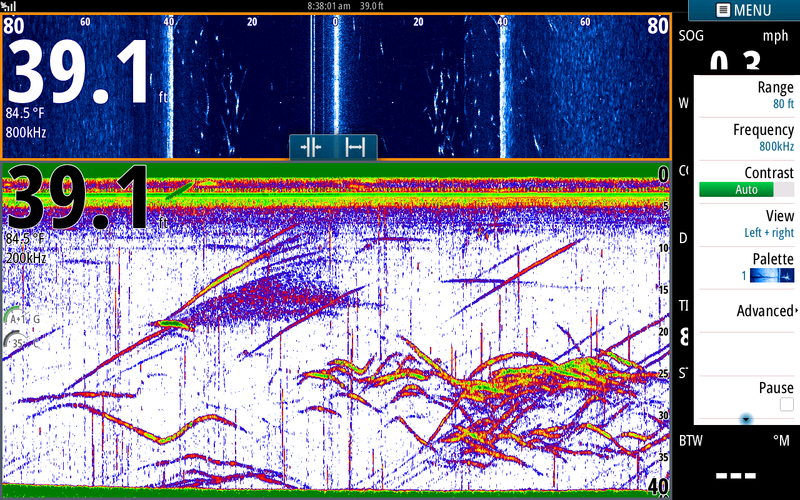 Thomas Harris is a rep for Navionics and will show you what a card for your unit can do for you in the waters you fish. He will actually insert a card into the unit of your choice and show you what you have been missing. Check 'um out, you will be glad you did! I picked my clients up at 6:15 and went looking for fish. Ten minutes later we hit our first school and had only gotten 4 lines out and they all hooked up. By the time we landed the fish and regrouped the school had moved on. After 15 minutes I got on the big motor and located this school. Yup, we had our hands full again. Nice fish in this school and quite a bit of them also. I could tell by the side scan picture that the school was moving to my right so I headed the boat that direction. The school migrated up onto a flat where they started busting on the surface. We are catching fish on downlines and free lines here. 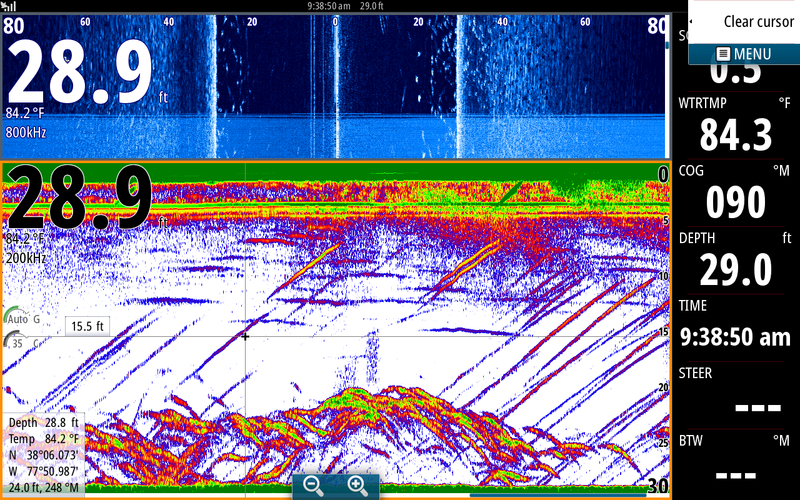 The vertical lines on the sonar page is interference with Lowrance on the bow. 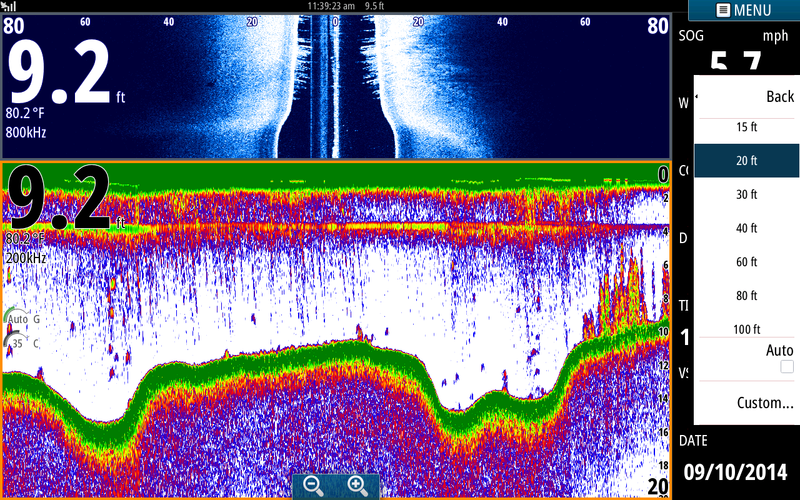 I was using the side scan that I have mounted on my trolling motor to follow the school ahead of the boat and using my dash mounted Simrad to scan left and right. 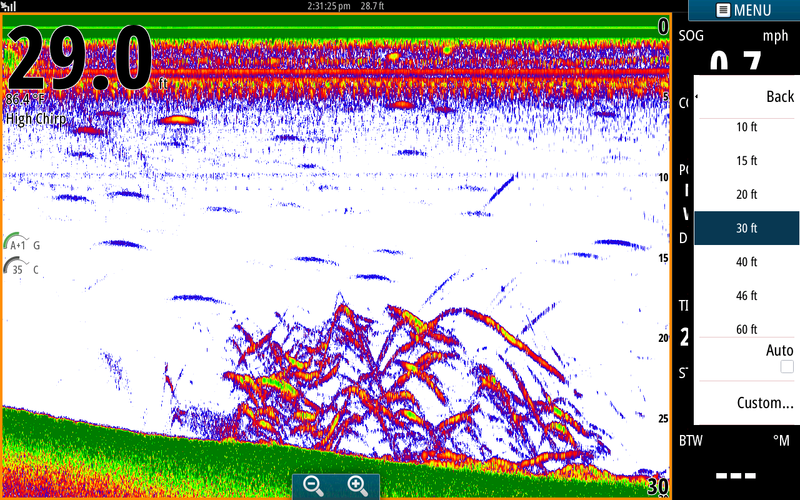 With both structure scans the school did not stand a chance, we went through over 100 baits in less than an hour. The smaller fish went shallower so I moved deeper where I saw the larger fish and worked them till we got tired and almost ran out of baits. I took the ladies back to the marina for a well deserved break. Here is a pic I took after emptying out my bait tanks this afternoon. I told my clients before I started to that more than not when I empty the tank I will see other fish and it happened, we went over this and all the lines took hits. No more bait!! !